As Halloween approaches, there’s a feeling of excitement in the air and decorations begin to appear in storefronts, lawns and doorways. Although this can be a fun time for people, Halloween can be stressful and potentially dangerous for canines. 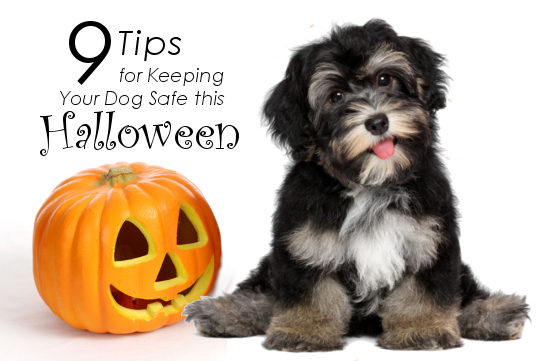 Fortunately, there are things you can do to keep your dog safe and happy this Halloween. Although it can be fun to take your dog trick-or-treating with you, it’s much safer if he stays at home. All the excitement and noise can be stressful for your pet, and crossing streets at night can also be dangerous for your dog. Unfortunately, incidents of animal cruelty also increase on Halloween, so it’s better to be safe than sorry. If you expect trick-or-treaters on Halloween night, be sure to keep your dog confined to a room far away from the front door. The constant ringing of the doorbell, and excited laughter of trick-or-treaters can cause your dog to become over-excited. If noise is still a problem, try turning on a TV or radio to drown it out, and help keep Fido calm. Chocolate candies are a favorite among trick-or-treaters, but they’re also poisonous to dogs. Help keep your dog and other neighborhood canines safe by only giving out non-chocolate treats. You should also read the labels of non-chocolate candies you’re considering purchasing to make sure they don’t contain the artificial sweetener Xylitol, which is also toxic to canines. While jack-o’-lanterns, Halloween lighting and artificial spider webs can give your home a festive appearance, they can also be hazardous to your dog’s health. Even small votive candles can cause fires, and extension cords can become lethal chew toys. Never leave your dog unattended when these things are present in your home. More and more people are dressing their pooches up in costumes at Halloween. If you’re considering doing this, be sure to choose one that is safe for your pet. Be sure the costume fits properly, and doesn’t present any choking hazards. Also, as cute as elaborate costumes are, they can also be uncomfortable for your pet. If your dog is easily-excited, you might want to stick with something more simple, like a Halloween themed collar or bandana. Before the sun sets and the trick-or-treaters come out, make sure your pooch has ample time to use the bathroom. Take him for a nice, relaxing walk and feed him his usual dinner. Dogs can sense nervousness and overexcitement in humans, so try to keep Fido to his usual schedule as much as possible. Try to stick to your dog’s normal routine on Halloween day. Consider taking her on a long walk, and spend time with her, and feed her at normal feeding time to reassure her. If your dog is easily excited, you might want to consider posting a sign in the yard, or near your front door, asking trick-or-treaters to keep the noise to a minimum. Make sure your dog wears a reflective collar with up-to-date license and vaccination tags, just in case you accidentally become separated on Halloween night. If you don’t know it already, take a moment to jot down the phone number and address of your local Animal Control, and take a good photo of your pet to help prove ownership. If you haven’t done so already, be sure to get your dog microchipped by your veterinarian. This is the best way to ensure that you and your dog are reunited should you become separated. Following these tips will help keep your dog safe this Halloween, and ensure the holiday is fun for you and your best friend. Holly Anderson Mastroianni is the owner of Royal Flush Havanese in Rhode Island. Royal Flush Havanese is dedicated to producing the finest Havanese puppies for sale and providing outstanding service in their care. Royal Flush Havanese is the only dog-breeder in the Ocean State to be accredited by the BBB.